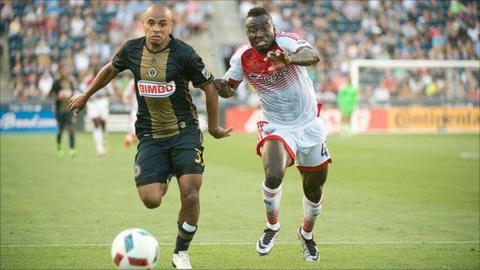 Alhaji Kamara (right) is moving to Al-Taawoun from MLS side DC United in a bid to play regular football. Sierra Leone international Alhaji Kamara, who was diagnosed with a serious heart condition in 2015, is joining Saudi Arabian top flight league club Al-Taawoun FC in a bid to gain regular football. The 23-year-old forward signed a two-year deal with the Saudi outfit from US Major League Soccer (MLS) club DC United for an undisclosed fee on Friday. "I'm delighted to join Al-Taawoun FC as I believe I have taken a good decision for my career," Kamara told BBC Sport. "I decided to move because I want to be playing regularly," Kamara said. Kamara was sent on loan to United States second tier league side Richmond Kickers as he struggled for playing time at DC United. He scored only one goal for DC United in nine appearances. Kamara, whose football career was halted in 2015 after he was diagnosed with a serious condition, says he successfully underwent a medical check-up in Portugal before his deal with Al-Taawoun went through. "I'm fit to play as I successfully went through a medical check-up," Kamara confirmed. Medical experts from European football's governing body Uefa advised Kamara to stop playing football after he was diagnosed with the problem. The condition was detected after he had scored six goals to help Norrkoping win the 2015 Swedish league. However Kamara decided to go the United States for further medical tests and specialists there gave him the green light to sign for DC United. He was surprisingly picked for Sierra Leone's opening 2019 Africa Cup of Nations qualifying fixture against Kenya which they won 2-1 two weeks ago in Freetown. But Kamara did not feature in the match as he did not travel to Freetown because of a demand by his then club DC United that a defibrillator be at the stadium during the game. He now joins a list of Sierra Leonean internationals that have signed for Saudi Arabian clubs. They include former Leone Stars captain John Sama, David Simbo and ex-Inter Milan and Monaco forward Mohamed Kallon who won the Asia Champions League with Al-Itihad in 2005.